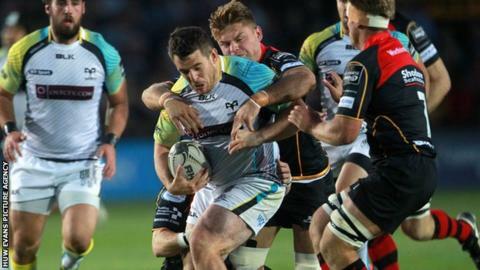 Ospreys hung on to beat Newport Gwent Dragons in an absorbing first Welsh derby of the Pro12 season. Tries in each half from Eli Walker and Rhys Webb saw the Ospreys take charge of the game at Rodney Parade. But four second-half penalties from young replacement Angus O'Brien kept the Dragons in touch. O'Brien nearly won it with a late drop goal, but the Ospreys had done enough to join Connacht on two wins from two games. Wales internationals Hallam Amos, Taulupe Faletau and Ian Gough were the three changes to the Dragons side following an opening defeat by Connacht. Ospreys had named an unchanged side following their 44-13 win over Treviso on the opening weekend of the season. But they were forced into a late change, with British and Irish Lions lock Alun Wyn Jones replacing Lloyd Peers, who missed out with a hamstring injury. Both sides showed plenty of enterprise and looked positive with ball in hand during the early stages of the game. However the crowd had to wait until the 14th minute for the first points of the evening, with Jason Tovey's simple kick giving the Dragons the lead. Both sides were reduced to 14 men when Dragons prop Lloyd Fairbrother and front-row opponent Nicky Smith were shown yellow cards. Dan Biggar, making his 150th appearance for the Ospreys, failed with a drop goal attempt before bringing his side level with a penalty. It came after Gough, playing his former side, was penalised for an off-the-ball challenge on his former team-mate and Wales fly-half. The Dragons were caught napping four minutes before the break when an opportunist kick by Webb set up wing Walker to run in for the game's opening try. Biggar added the extras to give the Ospreys a 10-3 half-time lead. The home side showed intent following the restart and replacement Angus O'Brien, on for fly-half Tovey, kicked a penalty to reduce Ospreys' advantage. Ospreys extended their lead when Webb got behind the Dragons defence to touch down for his second try of the season before Biggar's simple conversion. Lyn Jones' side kept in touch and 19-year-old O'Brien added his second penalty of the game. But they found themselves penned back in their own 22 as Ospreys piled on the pressure, although Biggar failed with a speculative long-range drop goal attempt. Referee Nigel Owens, after consulting with TMO Derek Bevan, showed try-scorer Walker a yellow card after a dangerous tackle on Tyler Morgan. O'Brien was successful with the resultant penalty before adding his fourth of the game to bring the Dragons within two points of 14-man Ospreys. The young fly-half came close to securing a dramatic late victory for the Dragons, but he pulled his drop goal to the left of the post and the Ospreys survived to maintain their 100% start to the Pro12 season and leave their Welsh rivals with the consolation of a losing bonus point. Newport Gwent Dragons: Lee Byrne (capt), Hallam Amos, Tyler Morgan, Jack Dixon, Aled Brew, Jason Tovey, Jonathan Evans; Boris Stankovich, Elliot Dee, Lloyd Fairbrother, Ian Gough, Rynard Landman, Lewis Evans, Nic Cudd, Taulupe Faletau. Replacements: T. Rhys Thomas, Owen Evans, Dan Way, Andrew Coombs, Andy Powell, Richie Rees, Angus O'Brien, Tom Prydie. Ospreys: Dan Evans, Jeff Hassler, Andrew Bishop, Josh Matavesi, Eli Walker, Dan Biggar, Rhys Webb; Nicky Smith, Scott Baldwin, Aaron Jarvis, Alun Wyn Jones (capt), Rynier Bernardo, Joe Bearman, James King, Dan Baker. Replacements: Sam Parry, Duncan Jones, Daniel Suter, Tyler Ardron, Morgan Allen, Martin Roberts, Sam Davies, Hanno Dirksen.